Eurocare Clinical waste services can provide pharmaceutical waste collection and disposal services tailor made for your site needs. All organisations need to be accountable for the waste they produce and how it then gets disposed of. When it comes to pharmaceutical waste there is legislation that you need to be compliant with to ensure that the waste is disposed of in a safe manner. Eurocare can ensure that you have all the appropriate systems in place to be compliant. 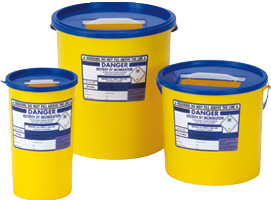 We offer a range of approved pharmaceutical disposal containers tailored to meet all requirements and levels of usage. All containers are made from polypropylene, and are puncture, impact, fluid and solvent resistant, offering complete protection for users. These containers are collected on a regular basis to fit in with your requirements. Eurocare are fully compliant with the Department of Health Guidance on the Safe Management of Healthcare waste and all wastes collected are disposed of in accordance with government legislation.